After leaving The Bowl, Jeff and I went to Flying Point on Mecox Bay for the clean wind usually available during big Southeast blows. Unfortunately it was East, not Southeast when we got there, but sail we did anyway. 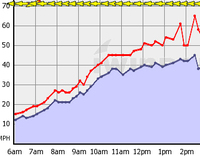 The wind was quite gusty, the water was kicking up two foot ramps (on Mecox we bet on 6-12") and 4.0's were the call. 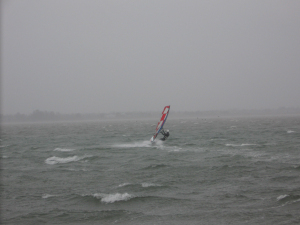 With the normally placid bay covered with rolling whitecaps, and a media frenzy around the nor'easter, we got more than a little attention from drivers by who were pulling over to catch ten minutes of lunatics windsurfing the storm. And when we were on shore grabbing gear or whatever, cars would pull over to chat. Usually when you're storm sailing, people who stop will say one of two things. Either they will ask if you're crazy, or tell you that you in fact are crazy. But not today...today for some reason people said things like "we really enjoy watching you," or asked if we were having fun. It was quite nice. The peak moment came as I was carrying my 4.0 across the road to the beach, when a car pulled over and 40-ish shiny blond with a car full of family wanted to know if we were actually going to windsurf. I smiled and said we were. That looks quite wild, the driver said...were we really going out right now? I confirmed that we were, at about the same time I realized that Christie Brinkley was my inquisitor. I managed to not start babbling, nodded my regards, and carried the sail past her car to the beach and my waiting board. I've been sailing in Southampton waters for fourteen years, but I've never had anything that could be remotely considered a Southampton "moment." Now I have. My full report: Christie was very nice, and very pretty. But even her magnificence was dwarfed by the strengthening winds. It was soon time to rig the 3.4, (Jeff was on a 4.0) and even that wasn't small enough for long. Three runs after rigging it, a series of gusts slapped us silly, a nasty mix of tailwalking, backwinding, and generally being madly overpowered. Got back to shore and agreed that it was time to get off the water. The closest windmeter shows a gust of 61 mph at the time. The good news is that they're calling for wind tomorrow. Puffin Dave Gellman contributes this find, as mega supermodel Gisele Bundchen was seen windsurfing. She clearly needs more downhaul. We're glad to see that she's sensibly wearing booties.